When should the Digit Widget be used? A moderate to severe PIP flexion contracture is difficult to treat with conventional hand therapy splints. The primary reason for splint failure is the amount of pressure they apply to the skin in their efforts to extend the joint. Brand and Hollister1 found that pressure on the skin during splinting should not exceed 50 gm/cm2 if the splint is to be worn for more than 8 hours at a time. Fess2 evaluated four different varieties of commercially available PIP extension splints and found that all of them generate a progressively higher force as the deformity increases. This force is transmitted via pressure on the skin of the finger. Consequently, long standing PIP flexion contractures or those contractures of more than 30-45 degrees cannot be effectively treated with dynamic PIP extension splints3. The Digit Widget avoids the skin pressure problems associated with conventional splinting by transmitting an extension torque directly to the joint by skeletal pins rather than through the skin, slowly reversing the contracture. If serial plaster casts or splints have failed, consider using the Digit Widget. Single stage surgical release of a PIP contracture is also problematic. It must be remembered that the joint is not simply flexed. All of the soft tissues on the palmar side of the joint are shortened. Blood vessels and nerves may be compromised with sudden contracture reversal. Several studies have shown that the more structures released to gain PIP extension, the worse the final outcome4-7. The Digit Widget is an effective tool in the treatment of moderate to severe PIP flexion contractures because it is able to extend a contracted PIP joint without surgical release of the volar structures, if the tissues are compliant and the joint is intact. The contracted tissues, rather than being surgically cut, are stimulated to lengthen over time. As effective as the Digit Widget is in improving joint extension, in most cases it is not the only intervention needed. The questions below are a starting point in the patients’ evaluation. The surgeon must determine if the underlying cause of the contracture can be successfully treated and, if so, formulate a plan to rebalance the flexor and extensor forces. Is the cartilage space substantially normal? Is the central slip intact? Do x-rays show concentric alignment of the joint? Is the joint capable of gliding motion? Is normal length and alignment of the proximal phalanx present? Are the palmar tissues simply shortened or is there scarring from previous surgery or injury? Are adhesions between the extensor tendon and the proximal phalanx preventing active joint extension? Are adhesions or other mechanical obstructions preventing distal gliding of the flexor tendons? Are the flexor tendons bowstringing across the PIP joint? Is spasticity present in the flexor muscles? Are the intrinsic muscles weak or paralyzed? How long is the Digit Widget worn? The Digit Widget should be worn until PIP joint extension has plateaued for several weeks. Most patients will achieve full or nearly full PIP extension. Many factors determine how quickly the joint will respond to the extension torque, including how severe and long-standing the contracture is, the presence of scarring from injury or prior surgery and the patient’s tissue response. A contracture of 90º or more may take eight weeks or longer to reverse. Graphing the patient’s progress will demonstrate changes in range of motion as a function of time and help determine when the device should be removed. To determine if the extensor tendon is competent to maintain joint extension following the device removal, remove the elastic band (not the bone pins) for a day to assess ACTIVE extension. If PIP extension is rapidly lost, the joint will require prolonged extension splinting, an extensor tendon reconstruction or some other reconstructive surgery. How much torque does the Digit Widget apply to a PIP joint? The extension torque ranges from 100g-cm (lightest elastic band) with the PIP joint at maximum flexion to almost 500g-cm (heaviest elastic band) when the joint is flexed to approximately 30 degrees. Many clinicians have quoted certain force or torque values as a maximum tolerated by the patient when correcting a stiff PIP joint. Don’t let these quoted values be confusing. They are not the joint torque that can be tolerated by the contracted tissues of the joint; they are the limitations resulting from the skin pressure imposed during conventional splinting. To our knowledge, no data exists regarding the optimal joint torque required for reversal of a PIP joint flexion contracture. Consequently, the Digit Widget provides a broad range of torque. 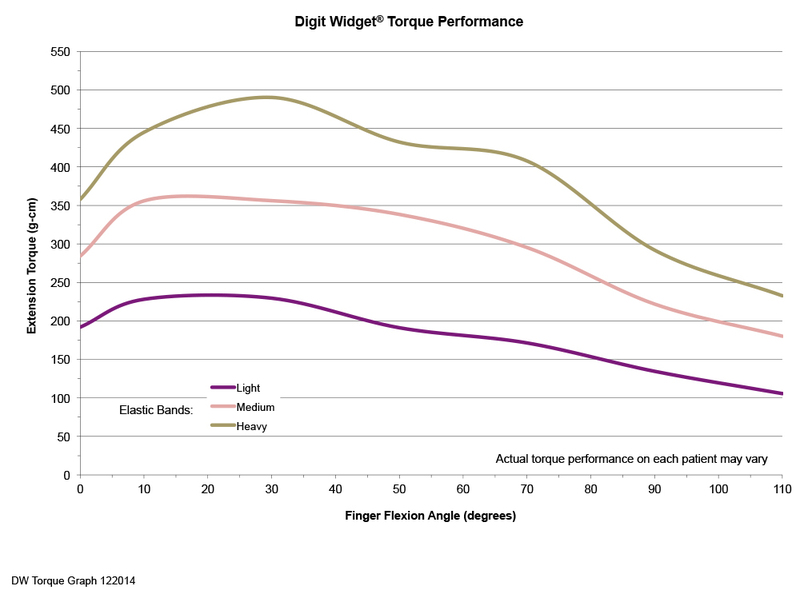 See the Digit Widget Torque Performance graph here. What band strength should be worn? The goal is to use the lowest torque necessary to reverse the contracture. Start with the lightest weight bands, which will be worn continuously. By monitoring both joint extension and the finger’s response to the torque, band strength can be increased as needed. The weight and number of bands used is dependent on the finger’s response to the torque. Decrease the extension torque if pain, swelling, inflammation, or loss of flexion occurs. A lower torque worn continuously without discomfort that results in a gradual increase in joint extension is ideal. Is it possible to wear more than one Digit Widget at a time? Absolutely. The Digit Widget is designed so that the torque applied to one finger is independent from the torque applied to another finger. Since the pins are installed dorsally, the device can be used on any finger. Below is a photograph of a patient with three devices on one hand. Should the bands be removed to exercise? Yes. For maximum effectiveness, the Digit Widget needs to be worn nearly full time. However, the extension torque can be temporarily removed by either detaching the Velcro tab from the back of the hand or by removing the elastic band from the posts. This allows unrestricted flexion of the finger. All flexion exercises should be performed actively. Passive or forced flexion of the PIP joint may damage an already compromised central slip and prevent the finger from maintaining maximum joint extension. Can the hand be washed with the device on? Yes. The device will not be damaged by water or soap, however, be sure to follow your physician’s advice about when it is acceptable to get the pins wet. To shower or wash the hand, the cuff and dynamic portion of the device can be removed. 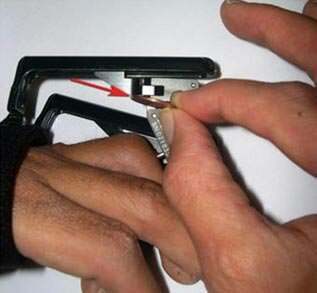 In order to “click off” the device, first, remove the elastic bands and then take a coin and slip it between the top of the pin block and the connector assembly. Give the coin a twist and the connector assembly pops off. See photo below. The coin needs to be inserted on the side of the pin block that has the words “Digit Widget” on it. Is the Digit Widget going to work for every PIP flexion contracture? The Digit Widget is a very effective device to reverse a flexion contracture. However, the flexion contracture is symptom of an underlying problem involving a torque imbalance at the PIP joint. 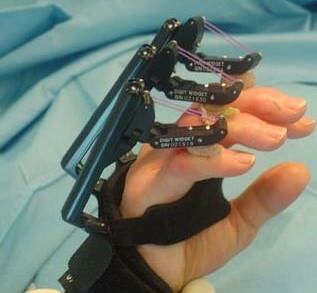 For joint extension to be maintained following device removal, the surgeon must formulate a treatment plan tailored to the unique findings in each patient and in each digit. The treatment plan relies on identification of the etiology of the contracture. Once identified, the cause of the torque imbalance must be something that can be corrected or the flexion contracture will recur once the Digit Widget is removed. What billing codes are used with the Digit Widget? Please be sure to bill each patient correctly. Click here for downloadable billing guidelines. Brand PW, Hollister AM: Clinical Mechanics of the Hand (3rd ed). St. Louis, Mosby, 1999, pp 218-219. Fess EE: Force magnitude of commercial spring-coil and spring-wire splints designed to extend the proximal interphalangeal joint. J Hand Ther Jan-Mar:86-90, 1988. Colditz, JC: Efficient mechanics of pip mobilisation splinting. Brit J Hand Ther 5:65-71, 2000. Curtis RM: Capsulectomy of the interphalangeal joints of the fingers. J Bone Joint Surg 36A:1219-1232, 1954. Curtis RM: Management of the stiff proximal interphalangeal joint. Hand 1:32-37, 1969. Ghidella SD, Segalman KA, Murphey MS: Long-term results of surgical management of proximal interphalangeal joint contracture. J Hand Surg 27A:799-805, 2002. Craft RO, Smith AA, Coakley B, Casey WJ, Rebecca AM, Duncan SFM: Preliminary soft-tissue distraction versus checkrein ligament release after fasciectomy in the treatment of dupuytren’s proximal interphalangeal joint contractures. Plast Reconstr Surg 128:1107-1113, 2011.